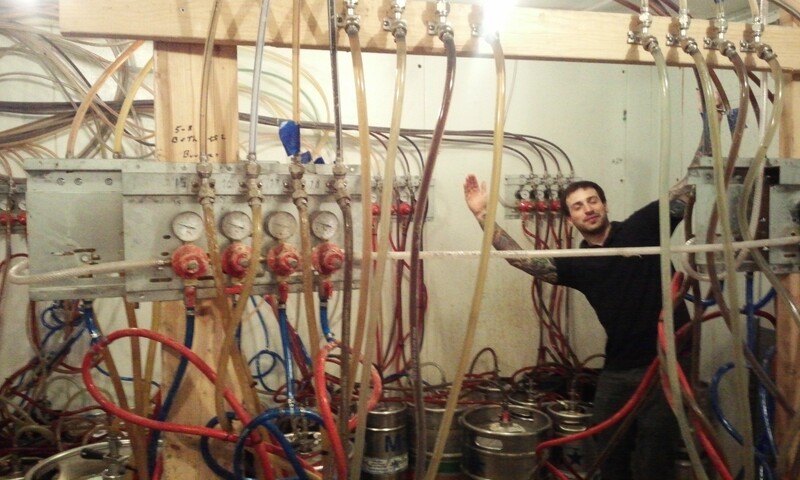 Zachary Uscinski, bartender at the Shepherd and the Knucklead, showing off the massive cold room. There are several reasons that I travel the two and a half hours to northern New Jersey from Connecticut every couple of months. There’s family members, of course: living reminders that my home state is always home, even if I haven’t really lived there for 22 years. There are the “old haunts.” Matthew’s Diner in Waldwick, the Ridgewood Wild Duck Pond, the Jersey Shore. 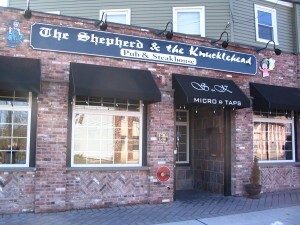 Now I have a tradition that stretches all the way back to 2011: stopping by The Shepherd & the Knucklehead Pub of Haledon. The bar there is diversely stocked with 90 taps, and the guys who run the place are just so friendly. They’re Jersey friendly, if that makes sense. As in — unlike New England friendly — they are inviting without the get-to-trust-you phase. The Shep is in the most unlikely of areas; it’s in a residential neighborhood, near bakeries and gas stations. But it’s close enough to William Paterson University, and that must be enough to keep the place hopping. I had no idea that it had been open since 1998, which is when — according to owner Chris Schivo in this neat commercial — there were only 20 taps. Schivo took the name of the restaurant from the title of his 2001 novel, which focuses on the responsible person within us (the Shepherd) and the other guy (Knucklehead). When you walk in, you notice the dark-stained wood bar, which complements the exposed-brick interior. It’s laid back, but not divey at all. There are board games, pool, and darts to get into and a restaurant off to the left that features steak as a primary go-to. The beers are constantly rotating; bartender Zachary Uscinski told me he’s constantly getting to know new beers, sometimes 15 at a time. I go for the beers that I can’t get in Connecticut, like offerings from Jersey’s Cricket Hill Brewing. Joe, son of Chris, is my contact. I met him on my first visit, and before he even knew I wrote a column or was familiar with craft beer, he was chatting me up on the latest rye beer or dunkelweissen or whatever it was. Soft-spoken but passionate about the Shep, Joe is clearly a proponent of old-school pub values: come in, relax, drink up, and say what’s on your mind. Looking forward to my Christmas visit. its a great place, i was there back at the beginning and yeah it was 20 taps max and not even the size of the main room. Have you been back to Matthews since they re did it? have driven past but have not been inside in years. I love it when I see a place grow into its own like that. OK actually haven’t been to Matthew’s for a few years, but I think it had been redone. That was my high school hangout.